Studies in Mathematical Sciences ( ISSN 1923-8444 [Print] ISSN 1923-8452 [Online]) publishes original work in all branches of pure and applied mathematical sciences. The journal aims to reflect the latest developments in mathematics and promote international academic exchange for pure and applied mathematicians, statisticians, system theorists and analysts, and information scientists. Contributions are not limited to the advance of new theories, but also include new mathematical and computational methods and techniques to solve various problems in science, engineering, industry and society. Appropriate subject areas include mathematical analysis, algebra, geometry, probability and statistics, stochastic processes, mathematical logic, numeric and symbolic computation, mathematical physics, linear operators, number theory, function theory, differential equations, financial mathematics, biological mathematics, etc. 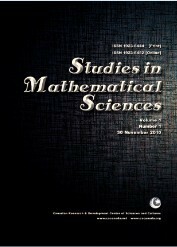 Studies in Mathematical Sciences is indexed by DOAJ of Sweden, indexed by CNKI of China, indexed by Journal TOCs of England, indexed by Open J-gate of India, is filed by Library and Archives Canada, Gale, EBSCO Publishing, Ulrich's of America, and collected by the database AMICUS of Canada, indexed by ProQuest LIC.  Articles cover a wide range of topics, including mathematical analyses, probability, statistics, cybernetics, algebra, geometry, mathematical physics, wave propagation, stochastic processes, boundary value problems, linear operators, and number and function theory. The journal is a valuable resource for pure and applied mathematicians, statisticians, systems theorists and analysts, and information scientists.  Format: The only format we accept is the APA style.  Language: The manuscripts are required to be written in English. 1. The manuscripts are required to be written in English, and they should be submitted to sms@cscanada.net or caooc@hotmail.com. The preferred format is MS Word. 3. The review process is about 14-60 days. We will immediately send you the reviewers’ comments by an E-mail. Please contact us if you haven`t got any information in two months. 4. You will receive on free sample of the issue that contains your article. Please contact us if you haven`t received it in a month. 5. The copyright of the articles goes to the authors, while SMS owns the first publishing right.